Greetings and thank you for visiting my website. I'm Rose Marie Saporito, formerly Rose Marie Kubacki, breeder of the Irish Rose line of Irish Terriers. I live in a small town in Chester County, Pennsylvania, which is located northwest of the city of Philadelphia. I've been breeding and showing Irish for about 35 years. I'm a past member of the ITCA board of governors, Judges' Education Chairperson, Trophy Librarian and have held other executive positions in both the ITCA and the Irish Terrier Club of New York. 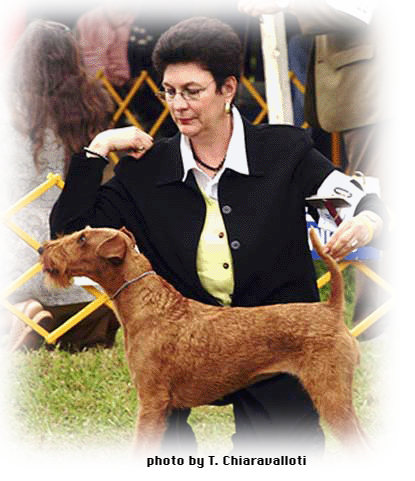 I am a member of the ITCA, ITCNY, the Irish Terrier Club of S. California and the Irish Terrier Association of England. The prefixes of Irish Rose, Sarsfield, Ballycallar and in combination with others have produced 40 champions to date. I have breed and raised over 40 litters of puppies. To continually improve my line I have expanded my pedigrees to include dogs from Rockledge, Cocksure, Aran Isles, Merrymac and English bloodlines. The dogs are bred for temperament and type, overall soundness and health to provide a foundation for great companions or show dogs. Purchasing a puppy begins with a phone conversation that helps to determine if an Irish Terrier is the right breed for your family. An invitation to visit the Irish at home on a one on one is the next step. This allows everyone the opportunity to met and mingle with the dogs, older and younger, in person. The various ages of maturity will give visitors a good idea of how the breed matures and whether an Irish is what they want to add to their home. Puppies are great salespeople, but puppies grow up to adult dogs. I also invite you to view current companions and other dogs that lie behind their legacy.